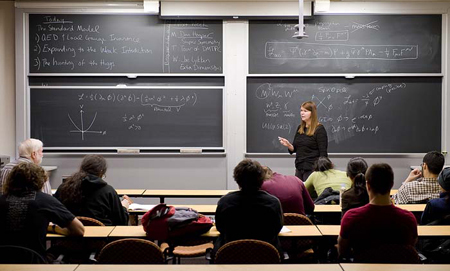 "From Graphene to Galaxies: Graduate Physics at MIT"
Professor Janet Conrad lecturing in her Introduction to Nuclear & Particle Physics class 8.276. An undergraduate degree in physics provides an excellent basis not only for graduate study in physics and related fields, but also for professional work in such fields as astrophysics, biophysics, engineering and applied physics, geophysics, management, law, or medicine. The undergraduate curriculum offers students the opportunity to acquire a deep conceptual understanding of fundamental physics. The core departmental requirements begin this process. The student then chooses one of two options to complete the degree. The focused option is designed for students who plan to pursue physics as a career. The flexible option is designed for those who are interested in other, perhaps nontraditional, career paths. Either option provides a considerable amount of time for exploration through electives. Students proceed at the pace and degree of specialization best suited to their individual capacities. Both options lead to the same degree: the Bachelor of Science in Physics. Information on these topics and more can be found within the Undergraduate Physics web pages on the left. If your questions are not answered after reviewing this information, please contact us at physics-undergrad@mit.edu. 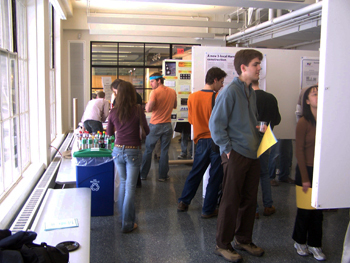 Poster session during Open House for prospective graduate students. Thank you for considering the Ph.D. program in Physics at MIT. Information regarding our graduate program and our application process can be found in the following comments and within the links on the left side of this page. If your questions are not answered after reviewing this information, please contact us at physics-grad@mit.edu.